Ultimate Bet (www.UltimateBet.com) is one of the oldest poker sites on the Internet with a history that dates back to 1999. The site did well for itself over the years by offering players lightning quick software and a wide variety of poker games and limits. Ultimate Bet still accepts players from the United States, and provides players from all around the world with a nice list of deposit and withdrawal options. Ultimate Bet recently merged with Absolute Poker to form the CEREUS network, which instantly became one of the most popular poker networks in the world. Strong points at UB include Team UB, which features Phil Hellmuth and other pros, tons of player traffic, and a huge sign up bonus. If you sign up at UltimateBet with referral code POKERSITEORG you will automatically receive a special 111% up to $1,100 bonus on your first deposit. for a 111% up to $1,100 Bonus! In an effort to increase its player base even further, Ultimate Bet merged with Absolute Poker in 2008 to create the Cereus Poker Network. This basically doubled traffic at both sites overnight and helped propel Ultimate Bet to new heights as one of the world’s most populated poker sites. All new players at Ultimate Bet qualify for a deposit bonus worth up to $1100 if they sign up with the referral code POKERSITEORG when creating their accounts. This is easily one of the best deposit bonuses on the Internet for both casual and serious players. The bonus is offered as a 111% match on each player’s first deposit. For example, if you sign up and deposit $200, Ultimate Bet will throw an additional $222 in there. The bonus money is cleared by earning Status Points in real money ring games and tournaments at Ultimate Bet. Every 20 Status Points releases $1.00 of bonus money, and the bonus is moved to your real money account in increments of $5.00. Status Points are earned in tournaments at a rate of 1 Status Point per $0.30 paid in entry fees. In cash games, players can earn up to 2 Status Points per hand. Learn more at our Ultimate Bet bonus guide. A buddy list makes it easy to keep up with your friends (or stalk the fish), and a simple note taking system comes in handy for all those players you see on a regular basis. The tables themselves can be customized with different skins, playing card styles, and viewing angles. 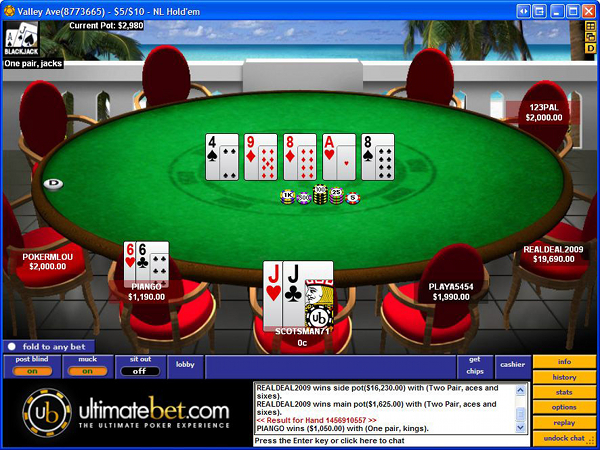 To top it all off, multi-tabling is supported and all poker tables at Ultimate Bet are resizable. Ultimate Bet is quickly becoming one of the top poker sites for tournaments. Players can participate in a massive selection of tournaments that range in buyin from $0 to more than a thousand dollars. Ultimate Bet also holds many satellite tournaments in which players can win seats to major poker events such as the World Series of Poker, the Aruba Poker Classic and many more. The tournament types offered by Ultimate Bet include freezeout tournaments, rebuy & addon tournaments, satellites, guaranteed prize pool tournaments, heads up tournaments and bounties. The largest guaranteed prize pool tournament at Ultimate Bet is the weekly $200,000 Guaranteed. Not only does the tournament feature a $200,000 prize pool every week but it also pays out $215 for each Team UB pro you knock out. Ultimate Bet has always had a fair amount of traffic but it significantly increased that traffic in 2008 when it merged with Absolute Poker. Today, Ultimate Bet is one of the most populated poker sites on the internet and almost always has 15,000+ players logged in. The competition at Ultimate Bet is about average for the industry. Players can get pretty wild in the tournaments but the cash games are a little on the tight side. However, there are so many players online at Ultimate Bet that if you do a little looking around, you can usually find several soft tables at each limit. The player support team at Ultimate Bet is fast and responsive but they suffer from one major drawback: players can only contact them via e-mail and live chat. A 24/7 phone number would be optimal but Ultimate Bet has yet to implement such a thing. The good news is that once you get in contact with their support team, they are fast to take care of any issues you may have. Ready to Play? Visit Ultimate Bet to Get Started Now! Now that you know everything about UltimateBet.com, it's time to get started. Visit Ultimate Bet and use referral code POKERSITEORG while creating your account to automatically receive our exclusive 111% up to $1,100 sign up bonus.